Neil Iyengar, MD - Play for P.I.N.K. Seeking to discover biomarkers that can identify women at risk of breast cancer and to develop prevention strategies to reverse this risk. Clinical studies are planned to identify women with localized breast inflammation who may be at risk of breast cancer and to test a personalized lifestyle intervention. These efforts will lead to more precise risk assessment and preventive strategies to reduce the incidence of breast cancer. Obesity is a well-established risk factor for breast cancer. Recent studies have shown that just having an imbalance of fat tissue to lean muscle can also increase the risk of breast cancer in healthy weight women. Dr. Iyengar is conducting studies to improve how we assess body fatness for breast cancer risk and to devise a precision-based exercise intervention for women with advanced breast cancer. Obesity is a major risk factor for the development of the ER-positive breast cancer—the most common type of breast cancer—after menopause. After a diagnosis of breast cancer, obesity is associated with a poor prognosis for all types of breast tumors. Local breast inflammation occurs in about 90 percent of obese women, but also occurs in 50 percent of overweight and 33 percent of normal weight women. Dr. Iyengar and his team were the first to describe what they call inflamed fat and the related molecular changes that can cause breast tumor development and progression. These changes include increased levels of aromatase, the protein that makes the female hormone estrogen, and alterations in metabolic and inflammatory factors in blood. This may explain why breast cancer patients who have inflamed breast fat have a worse prognosis and why normal weight, otherwise healthy women with inflamed breast fat, have elevated levels of aromatase. This year, Dr. Iyengar’s team will develop more accurate methods to identify women with breast inflammation and to develop ways to reverse the negative effects of energy imbalance on breast cancer prognosis. They have several trials planned to improve measurement of breast inflammation to more accurately identify women at risk of breast cancer and to test a precision exercise therapy in patients with metastatic breast cancer to identify the best level of exercise for this specific group. This research will provide evidence to support the development of targeted cancer prevention and treatment trials and represents a critical step in the development of more precise cancer risk assessment and prognostic strategies. Neil Iyengar is a medical oncologist and clinical-translational researcher at Memorial Sloan Kettering Cancer Center (MSKCC). 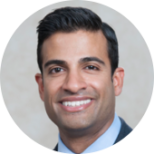 He is an Assistant Attending Physician in the Breast Medicine Service at MSKCC and also holds a joint research appointment at the Rockefeller University as an Associate Attending. He received his undergraduate and medical degrees from the University of Illinois College of Medicine in Chicago. He complete residency training in Internal Medicine at the University of Chicago followed by fellowship in medical oncology and hematology at MSKCC. His research has been supported by grant awards from several organizations including Young Investigator Awards from the Conquer Cancer Foundation and from Expedition Inspiration, as well as awards from the NCCN, the American Association for Cancer Research, and others. He has been invited to speak at international meetings and he has published several peer reviewed articles. Together with BCRF grantees Dr. Clifford Hudis (MSKCC) and Dr. Andrew Dannenberg (Weill Cornell Medical College), Dr. Iyengar steers the multi-institutional Obesity & Cancer Working Group – a highly productive translational research team that includes basic scientists, clinicians, epidemiologists, exercise physiologists, and other experts. Dr. Iyengar specifically studies the role of metabolic health and inflammation in the development and progression of breast and several other cancers. Given the rising rates of obesity worldwide, Dr. Iyengar and his team are working to develop feasible and highly-targeted preventive and treatment strategies aimed at adipose tissue inflammation, which are poised to have a broad public health impact.